Lando Norris may be in the spotlight after his McLaren announcement, but he isn't the leading Brit currently in F1's junior ranks. At a time when British representation on the Formula 1 grid is at its lowest full-time level in almost 40 years, the number of young drivers flying the Union Jack offers real hope for the nation’s future at the pinnacle of motorsport. The likes of Callum Ilott and Dan Ticktum are impressing in lower categories, but there are two main names leading the charge to add to the British presence in F1 next year. The one you will most likely have heard is 18-year-old Lando Norris. A rising talent under McLaren’s wing who has tasted success almost immediately at every single level, the correlations to Lewis Hamilton are easy to see, particularly following Monday’s announcement that he would be making his F1 debut in 2019 with the British team. Yet while the spotlight may have been on Norris, he is not the British driver leading the charge in F2. That honour lies with George Russell. A member of Mercedes’ junior programme since the start of 2017, Russell, 20, moved into F2 for 2018 after sweeping to the GP3 title last year. A maiden F1 test appearance with Mercedes in Hungary was followed by two FP1 run-outs with Force India at the end of the 2017 season, all of which saw Russell impress ahead of his move up to F2 for this year. 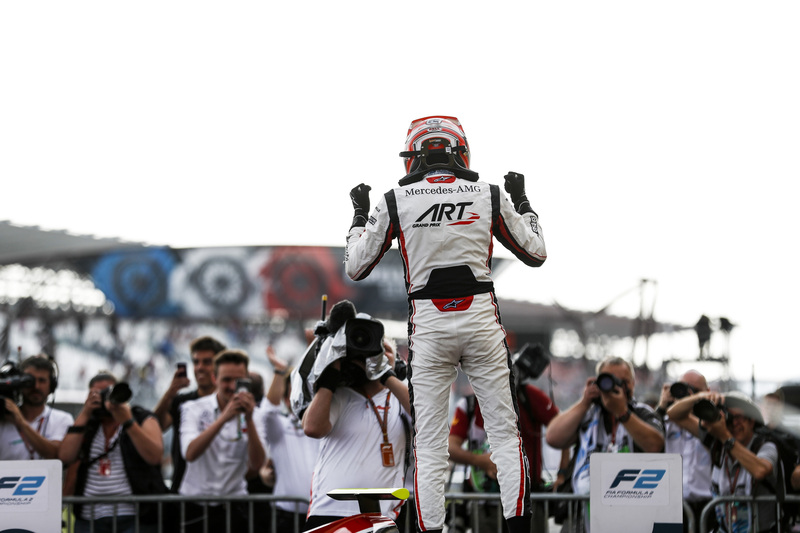 After taking his fifth victory of the season in Monza last Sunday, Russell sits 22 points clear of Norris at the top of the F2 standings with two rounds remaining. It's an impressive feat for a rookie driver, even if he’s simply meeting his own expectations. “I think [it’s going] probably as expected really,” Russell told Crash.net. “I felt confident approaching the season. I knew I was in a great team in ART, and even though they’ve struggled for the previous two or three years in Formula 2, I had the confidence that we could put things right and work really well together to get to the position we are now. The biggest hurdle for Russell this year has been reliability. Teething issues with the new-for-2018 F2 car have hamstrung many drivers through the field, yet of the title contenders, Russell has got the rawest end of the deal. The still-impressive 22-point margin belies his true quality this year. “It’s very frustrating how things have panned out a bit this year. Everybody’s having these issues, but I’ve kind of always had it at the worst point,” Russell said. “I had it in practice of lap one in Monaco - I’d never been to Monaco before! And qualifying was half the length than usual, so I had four laps to learn the track. Then I had it on lap one of Race 1 in Budapest, again, one of the hardest tracks to overtake on. Again on the out lap of my outlap for Race 2 at Paul Ricard when we definitely had the pace to win that race from P8. But Russell is not worried the car issues masking his form would impact his F1 hopes for 2019: “Everybody who needs to know, knows the situation. Everybody in this paddock watches the Formula 2 races. 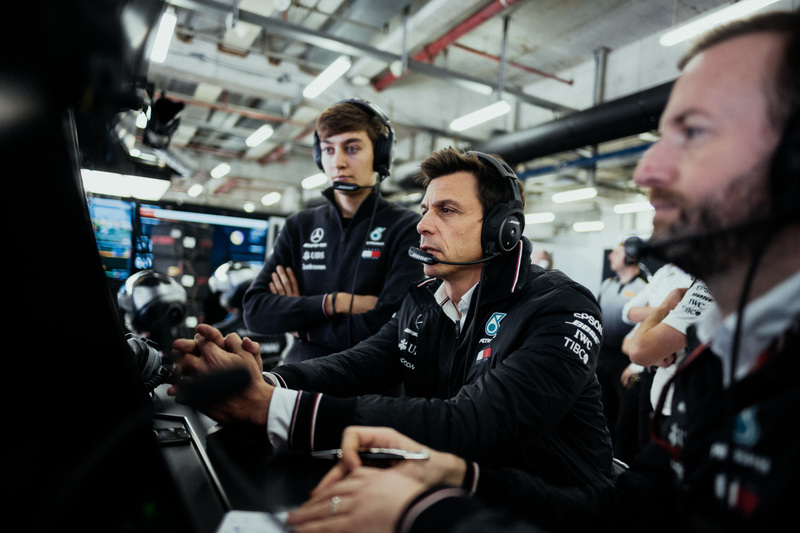 Even amid its string of title wins, Mercedes has always placed a strong onus on nurturing young talent, with Russell following in the footsteps of Esteban Ocon and Pascal Wehrlein. The open culture of the team has been particularly key in their progression, and was something Russell noticed from day one. “From the first day I really joined Mercedes, they’ve been extremely welcoming,” he said. “The first grand prix I ever came to with Mercedes was Abu Dhabi in 2016. I wasn’t officially signed, and I was in all the debriefs, all the meetings, talking with Toto [Wolff], talking with the engineers. While Russell is still in contention for an F1 seat in 2019, the surprise twists in the market over the summer have had a knock-on effect. Daniel Ricciardo’s shock decision to join Renault scrapped Ocon’s planned move to the team, effectively halting Mercedes’ succession plan for next year. The takeover of Force India by Lance Stroll’s father will also have an impact, with the Canadian expected to link up with Sergio Perez from 2019 (if not earlier). It has put Mercedes in a difficult spot with Ocon, and also with Russell, who would be unable to return to F2 were he to win the title. “It’s definitely had a bit of a knock-on effect, just because things have changed so much to what we kind of anticipated a month or six weeks ago,” Russell admitted. But Russell isn’t deterred, knowing the job he must do: “It’s definitely changed my position, but at the end of the day, all I can do is keep winning and keep putting the car on pole, and I’ll make the opportunity for myself. At 33, British sporting star Lewis Hamilton is edging towards the end of his racing career, leaving concerns for many about who will be the nation’s next great racer. Norris is the driver who is garnering the most attention. In the wake of McLaren’s announcement, he has been the focus of the British media, appearing in all of the mainstream papers and enjoying a considerable amount of coverage. Norris is ever-present in the media, and enjoys a decent following on social media, his account appealing to a younger fanbase with memes, gifs and vlogs. The hype may be with Norris, yet the outstanding results and displays this year have belonged to Russell. While he feels underestimated, there is no sense of annoyance or frustration. He instead shows understanding as to why Norris is in the spotlight, and a crucial awareness of the bigger picture. “Probably people have underestimated me this year,” Russell said. “I think I had two tough years in Formula 3 for various reasons. I’d probably say my first year was solely my fault really. I had the wrong approach and didn’t really adapt quick enough to the car, and that was the reason why I didn’t perform as well as I probably could have or that the car gave me. “In my second year, I was in a brand new team, new engineers, it was new to everybody. That again was the reason why it didn’t quite work out as it did. But in that second year, Mercedes saw through everything, they knew the issues, and that’s why they decided to still take me. “When you look at the underlying results and you don’t know the full situation, certainly my full CV isn’t as impressive as his. So when he comes into this championship, all the hype is around him. “I know what I’m capable of. I think Mercedes believe in me. I think it’s only normal that there’s a lot of hype and talk around him, because his CV is very impressive. Being ‘the next Lewis Hamilton’ is going to be tough, as F1 is in a very different period right now, offering its own set of challenges. Drivers no longer enjoy the luxury of days and days of testing, only being limited to a handful of opportunities through the year. “Things are definitely a bit different these days to what they were 10 or 15 years ago when teams were happier to throw a young driver in, just because there’s unlimited testing,” said Russell. “For a young driver to get that experience they needed in a Formula 1 car was almost easy. Whereas for me at the moment, you have two days of young driver tests per year, I’ve been fortunate enough to get a Pirelli day, and then just the odd FP1 sessions if they come or not. Difficult, but not impossible. Case in point: Charles Leclerc. After finding his feet following three tricky races in 2018, the Sauber driver has been one of F1’s breakout stars this year, meaning he is now seemingly bound for a Ferrari seat in 2019. His example is one Russell is hoping to follow. “You’ve only got to look at what Charles, Esteban and [Max] Verstappen, I think you throw these guys into a top car and they’ll do the job straight away,” Russell said. “If you’re a quick driver, you’re always going to be a quick driver. It doesn’t matter if you’re in Formula 4, Formula 3, Formula 2 or Formula 1. If you’re a driver who is extremely aggressive, you’re that kind of driver, and that just follows your career really. “I think the job that he’s doing and the other younger guys in Formula 1, it goes to show that we can compete with the best. I’m sure if you look at Lewis when he went into McLaren, he did the job straight away. The nature of the driver market for 2019 may mean Russell has to wait for his opportunity to impress on motorsport’s biggest stage. But if he can continue to show the kind of maturity and commitment that has got him this far, it is surely just a matter of time until his chance finally comes along. For it is really hard to see where Russell’s case for an F1 seat falls down. He is doing everything right on his side. If he does miss out on a drive for 2019, he’ll be a victim of circumstance and timing in this silliest of silly seasons. And if Russell does make the step up, it will mean we have two outstanding young British talents to enjoy and revel in, seemingly for many years to come.